Buddha (Skt. ; Tib. སངས་རྒྱས་, Sangyé, Wyl. sangs rgyas), usually refers to Shakyamuni Buddha, the Indian prince Gautama Siddhartha, who reached enlightenment in the sixth century B.C., and who taught the spiritual path followed by millions all over Asia, known today as Buddhism. Buddha, however, also has a much deeper meaning. It means anyone who has completely awakened from ignorance and opened to his or her vast potential for wisdom. A buddha is one who has brought a final end to suffering and frustration and discovered a lasting and deathless happiness and peace. སངས་, Sang means ‘awakening’ from the sleep of ignorance, and ‘purifying’ the darkness of both emotional obscurations and cognitive obscurations. རྒྱས་, Gyé means ‘opening’, like a blossoming lotus flower, to all that is knowable, and ‘developing’ the wisdom of omniscience—the knowledge of the true nature of things, just as they are, and the knowledge of all things in their multiplicity. Just as one wakes from ordinary sleep. So the awakened have blossomed like lotus flowers. As it says, they are like ‘blossoming’ lotus petals in the sense that through their genuine wisdom they have overcome the tendency to ‘shut down’ through lack of knowledge, and their minds are open to all that can be known. 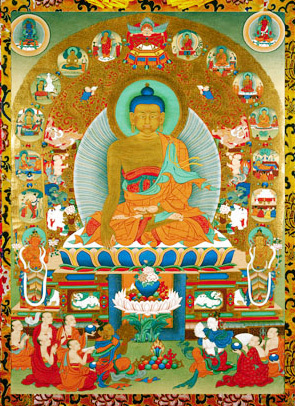 Buddhas are spoken of in terms of the kayas and wisdoms. The three 'bodies' of a buddha. They relate not only to the truth in us, as three aspects of the true nature of mind, but to the truth in everything. 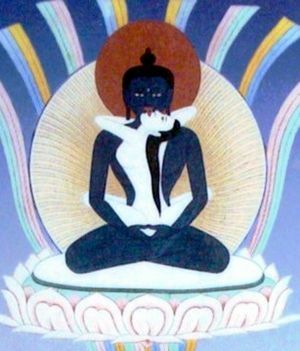 Everything we perceive around us is nirmanakaya; its nature, light or energy is sambhogakaya; and its inherent truth, the dharmakaya. 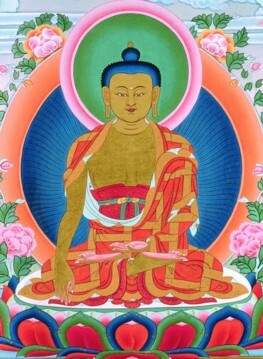 ‘the wisdom that knows the multiplicity of phenomena’ which comprises discriminating and all-accomplishing wisdom. They can all be condensed into a single wisdom: the wisdom of omniscience. And 7) the benefit of self and 8) the benefit of others. ↑ In the case of Buddha Shakyamuni, this was in the Lumbini garden. ↑ In the case of Buddha Shakyamuni, this was in the city of Kushinagara. 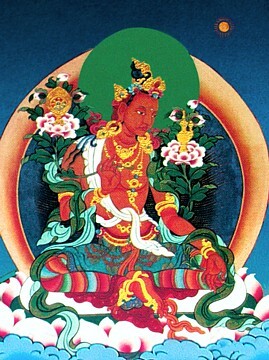 Khenpo Ngawang Palzang, A Guide to the Words of My Perfect Teacher, Shambhala, 2004, pages 101-107. This page was last edited on 20 August 2017, at 03:57.